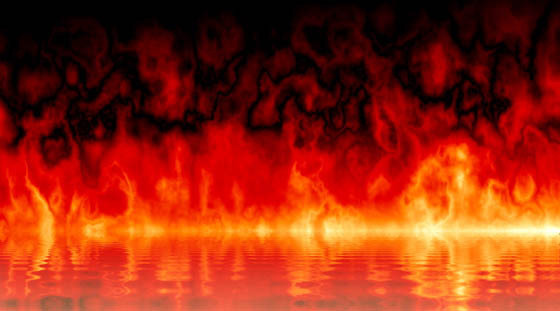 A lapsed Catholic is someone who no longer believes in Hell but knows he's still going there. A man, well, he'll walk right into Hell with both eyes open- but even the Devil can't fool a dog. A Christian telling an atheist they're going to hell is as scary as a child telling an adult they're not getting any presents from Santa. By means of shrewd lies, unremittingly repeated, it is possible to make people believe that heaven is hell- and hell heaven. The greater the lie, the more readily it will be believed. Communists worship the Devil himself. Socialists believe damnation is a good system run by bad people. And liberals want to send everyone to hell because it's warm there in the winter. Don't tell a man to go to Hell unless you can send him there. Easy is the slope to hell. Either heaven or hell will have continuous background music. Which one you think it will be tells a lot about you. Everybody's Hell is different; its not all fire and pain. The real Hell is your life gone wrong. For each time you say the phrases 'touch base,' 'networking,' or 'bottom line,' you will spend one month in hell. He who has money can eat sherbet in hell. Heaven for climate, hell for society. Hell has no terrors for pagans. Hell hath no fury like a woman. Why add extraneous details? Hell is in Heaven and Heaven is in Hell. But angels see only the light, and devils only the darkness. Hell is other people. And those people are French. I am an Agnostic because I am not afraid to think. I am not afraid of any god in the universe who would send me or any other man or woman to hell. If there were such a being, he would not be a god; he would be a devil. I don't like to commit myself about heaven and hell- you see, I have friends in both places. I have faith in the universe, for it is rational. Law underlies each happening. And I have faith in my purpose here on earth. I have faith in my intuition, the language of my conscience, but I have no faith in speculation about Heaven and Hell. I'm concerned with this time- here and now. If I owned Hell and Texas, I'd rent out Texas and live in Hell. In southern Nevada, there's only a screen door between you and hell. Life moves very fast. It rushes from heaven to hell in a matter of seconds. New York has always been going to hell but somehow it never gets there. Religion is for those who believe in Hell. Spirituality is for those who have been there. Sunday: A day given over by Americans to wishing that they themselves were dead and in Heaven, and that their neighbors were dead and in Hell. The pride of dying rich raises the loudest laugh in hell. There's a truism that the road to Hell is often paved with good intentions. The corollary is that evil is best known not by its motives but by its methods. The road to Hell is paved with good Samaritans. The road to Hell is paved with works in progress. The safest road to Hell is the gradual one- the gentle slope, soft underfoot, without sudden turnings, without milestones, without signposts. To scale great heights, we must come out of the lowest depths. The way to heaven is through hell. Twenty times in the course of my late reading have I been upon the point of breaking out, 'This would be the best of all possible worlds, if there were no religion in it!' But in this exclamation I would have been as fanatical as Bryant or Cleverly. Without religion this world would be something not fit to be mentioned in polite company, I mean Hell. What if God's a woman? Not only am I going to hell, I'll never know why! What was God doing before the divine creation? Was he preparing hell for people who asked such questions? When we preach on hell, we might at least do it with tears in our eyes. Whoever is in control of the hell in your life, is your devil. You won't burn in hell. But be nice anyway.